1960 Trojan Cabin Cruiser in need of a new Bottom. 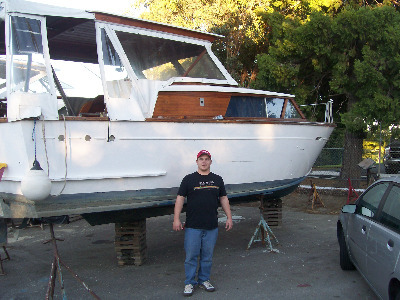 I have a 1960 Trojan Cabin Cruiser due to rot I have to replace the bottom! I was thinking about doing the whole thing with the marine plywood as I was told to but, I am planning on putting a fiberglass bottom over the top of it anyway. put regular lumber to make up the bottom then glass over it to make a seal? Comments for 1960 Trojan Cabin Cruiser in need of a new Bottom. I had a 63 and had to replace the top plank all the way around. That took over 1000 brass through screws and nuts. Each one had to be drilled calked and tightened one at a time with someone on the inside holding the nut. If you have that kind of time and are willing to do a good job, have at it. My suggestion is buy a fiberglass boat. Also, putting a fiberglass shell over the wood is a disaster waiting to happen. Mister will get in the wood and rot it more than it already is. I replaced the bottom on our 25' 1961 Caviler. Used marine plywood as screws 3M 5200. Replace any wood frames and stringers. Epoxy saturate and fill screw holes, 4 coats of Interlux barrior coat, anti foul bottom paint. Whenever you use wood on any boat, especially if below the Water Line. Use Marine grade wood. I have done this to my boat and had 23 yrs of good use thus far. You will be using ~16 sheets (4 x 10 x 1/2")in 2 layers for a permanent job and it will outlast your lifetime. Purchase this via special order through your lumber yard (not Lowes) or through the boat magazine adds. Use only bronze or stainless screws. If you buy them in bulk they are relatively cheap. stabiledj@yahoo.com and Ill guide you through it. Who is your Boat made by. I have a 1962 Youngquist 30' cabin cruiser. I would like to hear more about your boat and what your doin with her. I had a similar problem on a smaller boat where all the wood inside was rotten. I had to replace all the wood that was in boat's bottom. It took me over a year to finish everything but it will now be good for at least 20 more years. You can take a look at my project at http://www.diy-boats.com/2010/my-second-boat-lean-ii/, where I describe how to change the rotten wood and fiberglass it again. You can also take a look at the whole process at my Filckr gallery at http://www.flickr.com/photos/diy-boats/. This kind of project is very time consuming but will be worth the trouble at the end. The boat will serve you well if you do a good job. Glassing the bottom of a wooden boat is not something I would recommend. However, for it to be successful the wood you are applying the fiberglass to must be sound, dry and perfectly clean and oil free so that the epoxy will adhere properly. You are probably best to use plywood as there will be less movement in the wood than with ?regular lumber? planks.